Don’t forget to join up to the mailing list, and let us know what you think! So…you’ve poured all your blood, sweat, tears and inter-personal skills into making your film – what’s next? Well one of the next steps could be to find some film festivals to submit your film to. Set an overall budget of what you want to spend including both submission fees and travel/accommodation of the festival location. Have a look through each website and note what festivals you’d like to submit to, the cost and deadline for each. Subscribe to the site(s) and fill in the info – this is the time consuming part and you’ll need things like an online link to the film (password protected), synopsis, cast/crew names, budget of film, trailer, production photos and other bits and bobs. Once your profile is complete you’re able to submit. I’m targeting fairly local festivals as well as ones where I can stay with friends/family to keep costs down and some festivals are free to submit to, which is great. Make sure you find out how established the festival is – this generally relates to how long it’s been going, judges and venue. You don’t want to travel hundreds of miles only to be disappointed. There’s arguments for and against submitting to festivals due to time, cost and overall benefits. Ultimately, we all want to find an audience for our films and continue to make films. I’ve heard that being shortlisted/winning can potentially help your profile as a film maker and boost your reputation. Also, attending festivals means you’re likely to meet other like minded people and contacts. If you’re prepared with a synopsis/treatment/ideas for next projects then you never who know you’ll end up chatting to – this can open up further opportunities. Feel free to comment with any top tips you have! Following winning the Pitch competition last month, we’ve put the Only Child concept trailer in for the March edition of Chapter Moviemaker. It’ll hopefully provide a good opportunity to raise some interest and talk a bit about plans for filming in the summer, as well as getting others on board. Chapter Moviemaker is a monthly event at Chapter Arts Centre in Cardiff, where filmmakers can have their short films shown on the big screen. It’s a great atmosphere with plenty of good Q&A banter from Tom Betts, as well as plenty of time to chat/network afterwards. It provided a good opportunity to screen Escape back in January. Last Wednesday I was invited to join Nicola Heywood Thomas for the Arts Show on BBC Radio Wales to talk about Only Child. It’s the first time I’ve been to the BBC studios, or been on the radio (apart from when our lower school nativity play was featured on local radio back in Bedford, when me and my two best friends, also called Andrew, were playing the three camels – still remember the song… ‘We are camels, very important animals’… anyway I digress) so was pretty nervous about the whole experience! But Tessa the producer and Nicola the presenter were both really welcoming and friendly. By the time it came to go on air, it felt like it was just going to be a pleasant chat about something I care about – which it was! Got any tips for radio interviews? Or any horror/humorous stories of radio interviews gone pear-shaped? Let us know in the comments below! 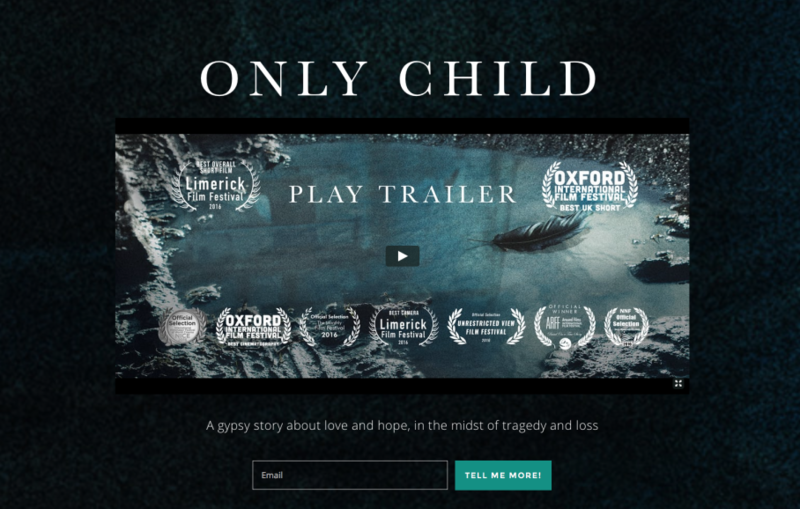 For almost the last year I’ve been developing ideas for Only Child, a short film about shared grief, based on the Bible story of David and Bathsheba. I entered Only Child into the Pitch competition back in September, and was selected as one of the ten finalists in November. But it was last week that I finally was able to present the idea to a panel of judges at Pinewood Studios. Amazingly, Only Child was unanimously chosen as the winner against some seriously strong competition! The Pitch team put together this short video with my initial reactions to winning, as well as a bit more about the idea. I’ll be blogging more about Only Child in the coming weeks and months leading up to shooting, hopefully in June – so watch this space!